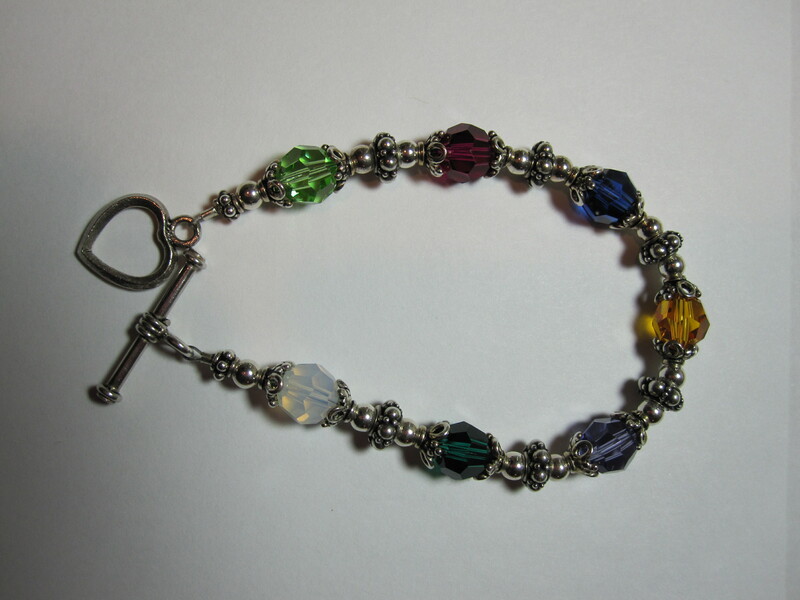 I have made for myself and some friends and family what I call a “family bracelet”. You could also call it a “mother’s” or “grandmother’s” bracelet. 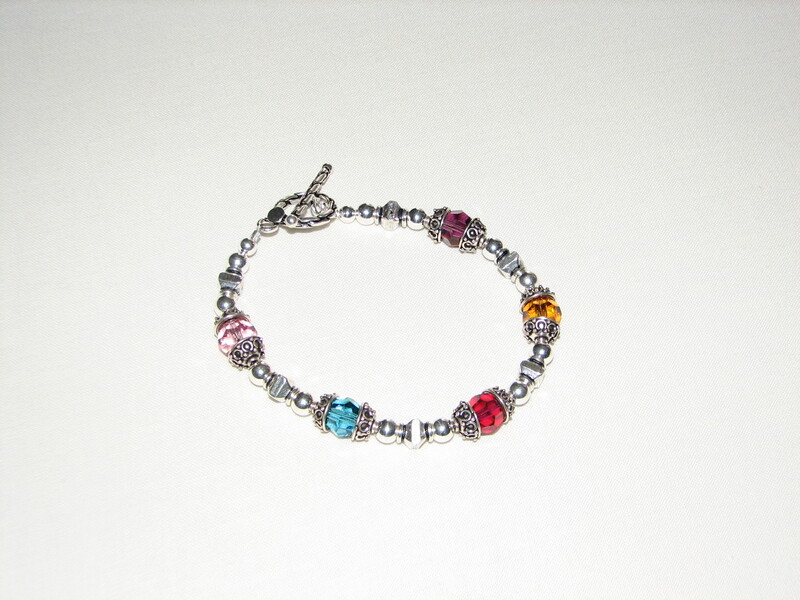 I am offering these bracelets as a special order for yourself or to purchase as a gift. 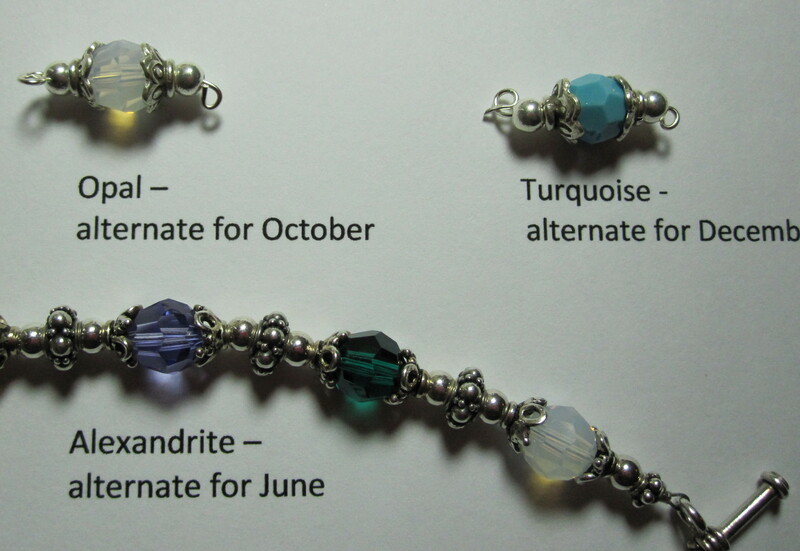 I can make a bracelet with three to eight birthstone crystals. (If you need more than eight, I can make it with less silver and do up to twelve.) In between the Swarovski 8mm crystal birthstone stations will be sterling silver seamless beads and Bali beads of varying designs. Each crystal will be flanked with a sterling silver bead cap of various designs. I will make it with as many silver beads as necessary to make the design look balanced and for the bracelet to be the right size. 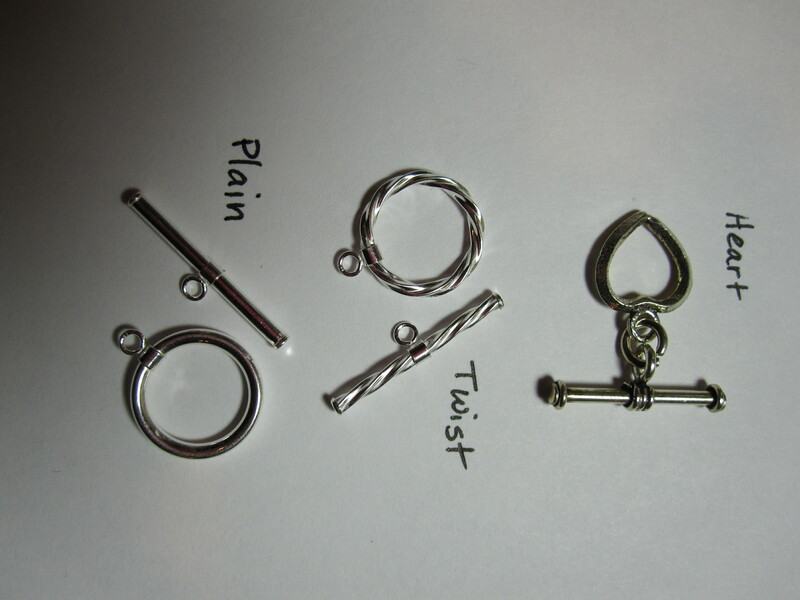 All components will be solid sterling silver, including the toggle clasp. My lighting in the photos is not the best – I apologize! 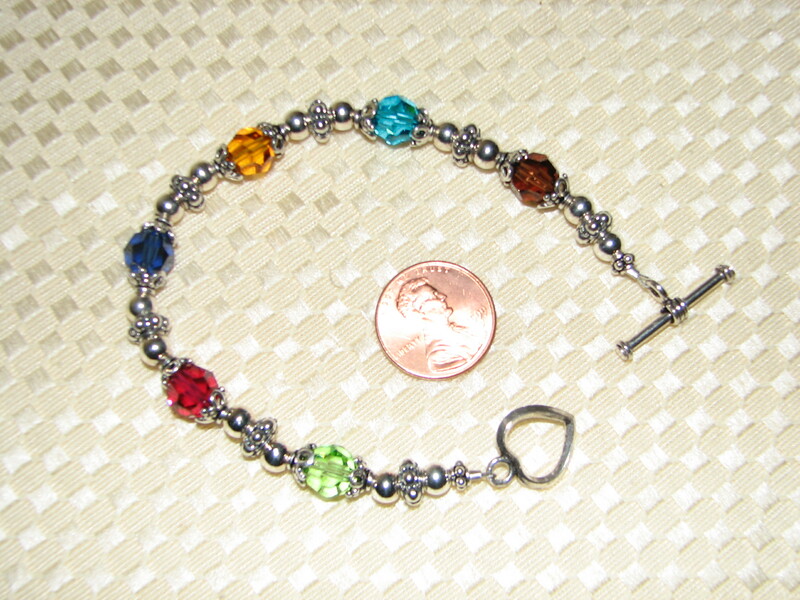 I like to play with the birthstone color a bit if it helps the design of the bracelet. 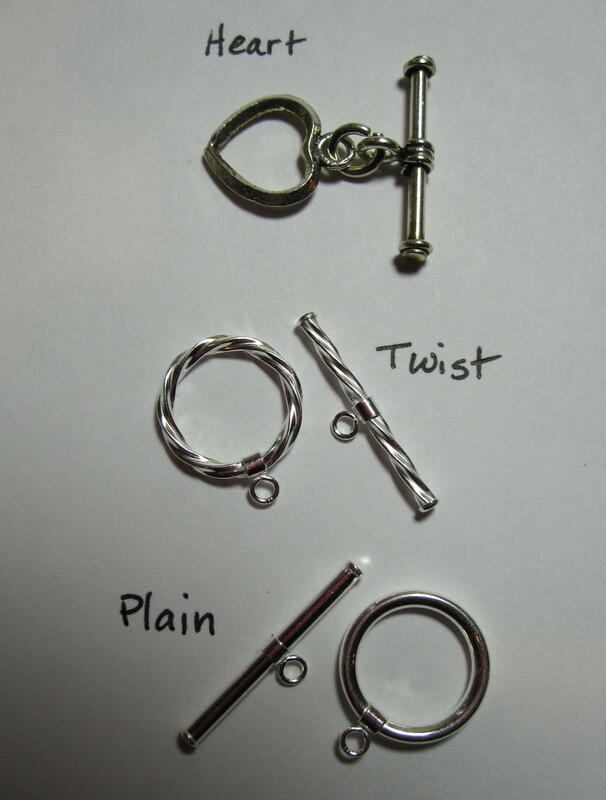 If I think an adjustment should be made to your bracelet I will talk it over with you and send photos if necessary. Some families have multiple birthdays in the same month. For some months there are alternative color choices, such as November, which is Topaz. I usually use a golden color, but you can also use a blue topaz. If you are interested in placing an order, leave a comment or email me at goodbyeordinary (at) yahoo (dot) com. 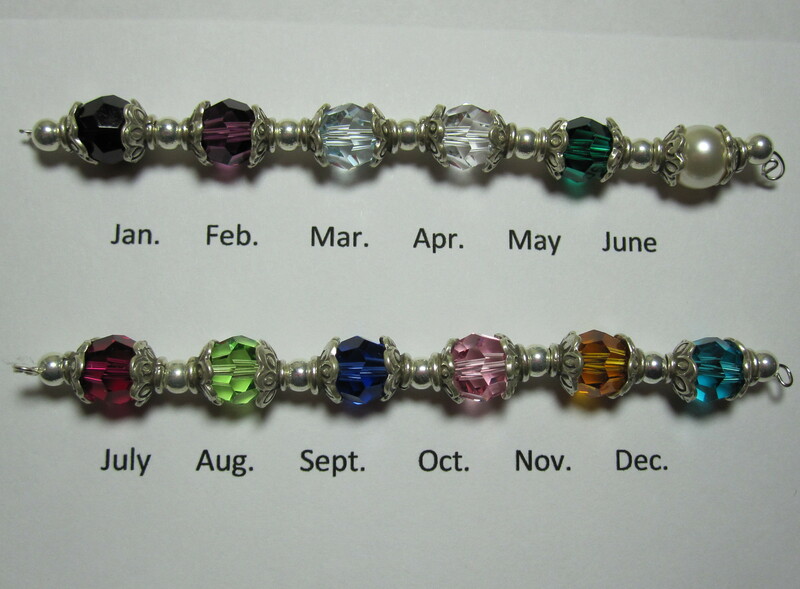 You will need to tell me the months for the birthstones you want to use, the toggle design you like, and the length of bracelet that works best for you or the recipient of the bracelet. The price is $50. I can send you a paypal invoice to pay for your order. If I need to mail it to you (because you don’t live in the Portland area), I can let you know what I need to add for postage cost when you choose the mailing method. Thank you for considering a purchase of one of these bracelets to help us raise money for our adoption! I have enjoyed making semi precious gemstone jewelry for years. I decided to get a little more serious about it so that I could hopefully make some money for our adoption. Please drop by and take a look and pass on my store link to anyone you think might be interested. I plan to add more things as often as I can. Everything I make is one of a kind.